On Wednesday I attended and photographed the Simple Salsa cooking class at La Cocina. A while back I wrote about the amazing work that La Cocina does in San Francisco, but here is a quick synopsis before we get to the photos. La Cocina is dedicated to expanding business opportunities for low-income women food entrepreneurs. La Cocina provides affordable commercial kitchen space, guidance to its participants for planning and growing their businesses and access to larger markets for their products. La Cocina helps local women become economically self-sufficient and contribute to the vibrant San Francisco economy doing what they love to do. If you are interested in learning more about the wonderful work La Cocina is doing here in San Francisco, please visit them here. Simple Salsa was taught by Isabel Caudillo of El Buen Comer. Isabel specializes in guisados—stewed meats in wonderful sauces—and her class covered both fresh and cooked salsas. I learned a lot about the different types of chiles used in mexican cooking and also about the different ways to prepare salsas. There are raw, fried, roasted and boiled salsas; each technique seeks to maximize the flavor of the ingredients it features. Isabel did an amazing job sharing the building blocks of salsa construction so that participants can create amazing salsas at home. I was so inspired by the class and cannot wait to try out Isabel’s recipes at home. Here are some photos I took during the event. If these salsas tempt you as much as they tempted me, you can try Isabel’s food at Sunday Suppers from 5 – 10 at Heart Bar on Valencia St in San Francisco. If you’re interested in taking a cooking class at La Cocina, find out more information here. Onto the fish. I love fish, but didn’t always. I was a reluctant fish-eater until my sweet love Jordan opened my eyes to the deliciousity of the underwater buffet, and now I am officially a convert. Despite our devotion to pork, most weeks we eat more fish than meat. But, those fishies can get expensive—hence our experiments with cheaper, more plentiful varieties like squid and sardines. Last week we splurged on a branzini, not as cheap as sardines, but not breaking the bank like salmon or halibut. Isn’t he a handsome devil? Cooking a whole fish is amazingly easy. The most important thing is to not overcook it. Giving it a liberal dose of salt, pepper and lemon juice doesn’t hurt either. Preheat an oven to 350 degrees. Clean and descale your fish, or have your fishmonger do this for you. Lightly coat an oven-safe saute pan in olive oil. Sprinkle both sides of your fish with salt and pepper. Stuff the belly cavity with herbs and lemon slices. Put your fish in the pan and bake for 15 – 20 minutes, until just cooked. This is a great trick for checking doneness of fish. Jordan taught it to me, but it is originally from Eric Ripert. Insert a very thin knife (or better yet, a needle) into a fleshy part of the fish. Remove the needle and immediately touch it to your finger. If it feels room temperature to warm, the fish is done. If it is hot, you’ve overcooked the fish. If it is cold, give the fish a few more minutes. We served the fish in the pan with an extra sprinkling of lemon juice and herbs. Whole fish is trickier to eat than fillets because it has a lot of bones, but if you’re careful, you can pretty easily extract the fillets from the skeleton. Whole fish appropriately baked are wonderfully succulent and the cooking method really honors the flavor of the fish. If you’ve never enjoyed a whole fish so simply prepared, dive in! And don’t forget to eat the skin! It’s the best part! Living in San Francisco, one encounters many smells. Some good, some not so good. But one that always excites is the smell of charring ground beef getting ready to be made into a hamburger. Unfortunately, this pleasant smell isn’t always followed by delicious food. As a matter of fact, it can be quite hard to come across an exceptional burger. This is obviously a problem for us, so we took things into our own hands. Before I explain how we achieved burger satisfaction, I must thank our friend and neighbor Robin for getting this whole burger movement started. She purchased a small grill and has provided us with some fantastic cheeseburgers in the past few weeks. It had been a while since I had made a proper cheeseburger, but with the right ingredients and tools, making an excellent cheese burger is fairly simple. Before I explain the technique, a quick note about ingredients. Obviously, we care a great deal about quality and sustainability when it comes our food, and a cheeseburger is one of the few places where very high quality meat, cheese, and produce can really shine (and only for a little more cash). For these burgers, I used 16 % fat, grass-fed ground beef and seasoned them with salt about an hour before cooking. The onions came from our csa and cooked up delicious and sweet with butter, olive oil, and plenty of time. The aioli is homemade and leftovers get turned into a terrific buttermilk dressing perfect for coleslaw. And the buns, while not homemade, are from Acme Bread; they have a great texture and a nice, yet mild taste. So, how does it all go together? We’ll start with cooking surfaces. As far as I’m concerned, you can either grill your burgers or cook them on a flat surface (preferably cast iron). Since I don’t have a grill, I use a flat cast iron surface that covers two burners. There are a couple advantages with this method: you can cook more food on the large surface (either more burgers, or onions, like I did), and by cooking the burgers on this flat surface, the juices kind of self baste the meat as it cooks. As I said earlier, I formed and seasoned the burgers about an hour before cooking so the salt gets a chance to season the center of the burger. Around this time, I also started caramelizing the onions over medium-low heat with butter and olive oil. Once those are at the desired consistency, you can turn the heat off and just warm them as the burgers are cooking. To cook these magnificent burgers, turn your burner up high and get that pan smoking. Carefully place the burgers over the heat and leave them for 2-3 minutes, until they are dark brown and you can see the it’s half way cooked. Turn down the heat to medium-high (cast iron has will just keep getting hotter and hotter, so you really have to keep an eye on your temperature). Flip and leave for a couple more minutes and add your sliced cheese. Cover for thirty seconds to one minute, until the cheese is melted and the meat is finished cooking (medium-rare, please). Set burgers aside and toast those buns. Slather on some aioli, then the burger, caramelized onions, some sliced pickle, and a little ketchup. Serve with some coleslaw or a salad and a nice beer. Heaven. What does one do when one somehow (how?!?) forgets an entire tin of shortbread cookies on top of her refrigerator? Well, this girl turns those past-their-prime cookies into a delightful pie crust. And then fills that pie crust with a dreamy lemon cream. Forget about a tin of these cookies or purchase a decent shortbread cookie. 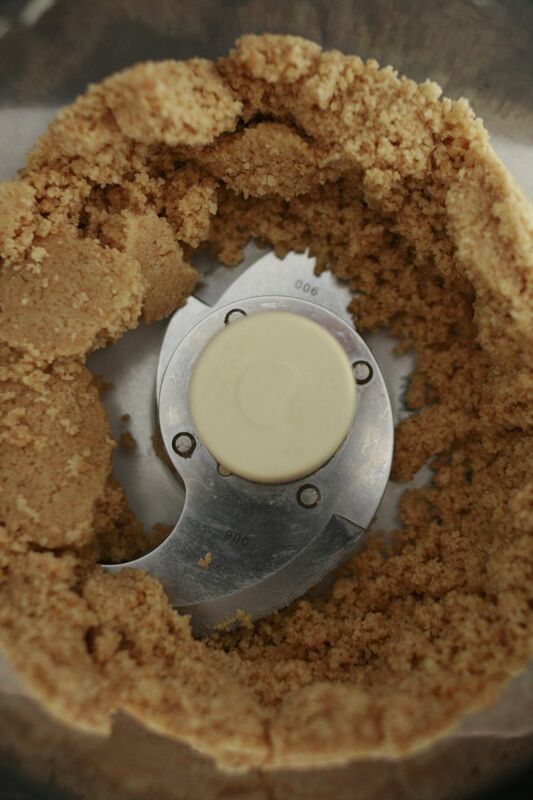 In a food processor, process the cookies until they are sand-like and start to come together. At this point, you may need to add a little melted butter to bring the crumbs together. My cookies were already so buttery that I didn’t need to. Push the crust into a tart pan or pie dish using the back of a measuring cup. Refrigerate the crust. In a metal or glass bowl set over simmering water, whisk together the lemon juice, eggs and sugar. Tip: Don’t let the eggs and sugar sit together without whisking because the sugar will “cook” the egg and make the whole mixture grainy. Continue whisking until the mixture has reach 180 degrees and is a thick custard. Take the bowl off the heat and let it cool to 140 degrees. Once it has cooled slightly, blend in the butter 1 T at a time. The Tartine Bakery Cookbook recommends using an immersion blender for this step. Once you have added all the butter and the mixture is smooth, pour it into the tart shell. Refrigerate for a few hours to let it set up. I served this with peaches one night and on its own the next. Both were wonderful. Jordan and I have a new plan. We’ll call it Chez Jojonoodle just to keep things simple around here … craving details yet? The goal: to challenge ourselves culinarily and bring new recipes to you. The method: download the weekly menus from the famed Chez Panisse and make at least one dish from that week’s menu going off nothing more than the title of the dish. What fun! Our first foray into the Chez Panisse/Chez Jojonoodle challenge was from the menu on Thursday, July 7th: Hand Cut Saffron Pasta with Monterey Bay Calamari. We had invited our adventurous eater friends Matt and Alexa over for dinner and dove right in. I made the saffron pasta, making a few adjustments from the egg pasta recipe I explained here and Jordan took on the squid. I followed the same egg pasta recipe I’ve used in the past but with one small tweak. 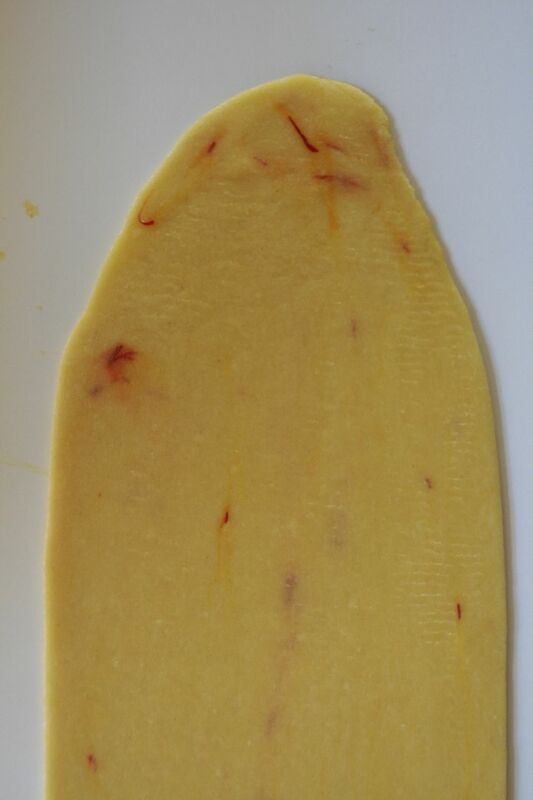 For a saffron pasta, infuse one pinch of saffron threads in the 1T olive oil and 1T warm water mixture. It will dissolve some, but use a pestle to crush the threads a bit to encourage the infusion before adding it to the eggs. Follow the rest of the pasta recipe as directed here. One additional note: I would highly recommend dusting each sheet of pasta with flour before cutting into strands. This will save you a lot of time pulling sticky pasta strands apart or prying them off a baking sheet before cooking. Cook the pasta in boiling, salted water for 4 – 6 minutes and toss with olive oil. Remove the beaks and spines of the squid. Rinse them off and refrigerate until ready to grill. Make a marinade with olive oil, lemon juice, salt, pepper and chili flake. Heat your grill (or grill pan in our case) to medium high. Just before grilling, toss the squid in the marinade. Grill them for just 1 – 2 minutes per side. If you overcook the squid, they will be tough and nobody wants that! To serve, top the olive-oil-dressed pasta with the squid. Squeeze a good amount of lemon over the squid and sprinkle with chopped herbs. Before I made the pasta, I thought the saffron might have just been a throwaway – something that makes a dish sound appealing, but doesn’t actually contribute any flavor. I was wrong. The floral flavor of the saffron really came through in the pasta. Also surprisingly, the squid had a lot more flavor than expected. Calamari usually just taste like the breading they are fried in, but these grilled squid had a noticeable ocean flavor. Maybe it was because of the simple preparation, or maybe because they were young and very fresh. Another plus: squid are an inexpensive and sustainable seafood. Overall, this was a very fun dish to prepare and tastier than expected! I’m looking forward to our next interpretation. I’m sure it won’t surprise you that we go through a lot of vanilla extract. And that stuff, especially the good stuff with a strong vanilla flavor and no added sugar, isn’t cheap. After some research, I was amazed to find just how easy it is to make your own – just two ingredients, a glass jar and a little waiting. Split and scrape the vanilla beans. Place them in a glass jar. Pour in the vodka. Submerge the beans and give it a good shake. Place it in a cool, dark place and let it infuse for at least 2 months, shaking it occasionally. After two months, your vanilla extract is ready to use and you can bake your heart content. How easy is that?!? This vanilla extract is so flavorful and delicious. The awesome part about this process is that you can choose your favorite variety of vanilla bean and make an extract that you might not be able to find at the store – Indian, Bourbon, Indonesian. Plus, you’ll save a few bucks and end up with a higher quality product. Not too shabby! I very much enjoying making my food blog rounds, collecting new ideas, ooohhing and ahhhing at all the pretty photos and delicious dishes. There are just so many amazing cooks out there – it’s both intimidating and inspiring! These whole wheat shortbread cookies caught my eye on Lottie + Doof, a fabulous and adventurous mostly baking blog. They were just too adorable (and contained too much butter) not to make. I had high hopes to turn them into nectarine sorbet-shortbread ice cream sandwiches. The sandwiches never happened, but these cookies were wonderful. Heat an oven to 325 degrees. In a large bowl, combine the flours and cornstarch. In standing mixer, beat butter, sugar and salt together. Add the flour mixture and mix just to combine. Be careful not to overmix – you don’t want a tough cookie! Line several baking sheets with parchment. Roll out the dough on a flour dusted workspace. I rolled mine out to about 1/4 inch thickness. Cut using cookie cutters into your desired shapes – I choose a round because it was the only cutter I knew its whereabouts. Transfer onto your parchment lined sheets using a thin spatula. The dough is very soft and your meticulously cut shapes can get a little wonky if you’re not careful with them. Bake for 12 – 15 minutes, until just golden on the edges. Let them cool for a few moments and then dust with sugar. After dusting, let them cool completely on a wire rack and then enjoy! These cookies are wonderful – so light and delicate and just sweet enough. They are good with sorbet, with coffee, and all by themselves. The recipe makes a lot of dough … I would recommend halving it or saving some of the dough in the freezer for the next time a shortbread craving strikes. If you decide to go the freezer route, let the dough come to cool room temperature before rolling it out and then bake as directed above. And wow … we’ve had a lot of sweet treat posts in a row. Where’s Jordan to help set this course right?